Viewing topic "Motif XF8 Freezing Up When I Switch Modes/Master Programs"
I’m having serious issues with my Motif XF8. Starting around six months ago, I noticed that my Motif was “slowing down”. Longer and longer lag times when switching between modes (up to 15 seconds), when switching between songs, even when switching voices. More recently I’ve noticed a slight latency between when I press the keys and when sound is produced. This is most apparent when playing string sections and the pianos. A very weird delay, like I was playing on sponges that triggered really slowly. Other weird thing: when switching back from a performance/song/pattern that I edited to Master Mode again, it would sometimes reference the wrong performance etc. I would have to switch to the next button, and then back, and let it sit for 5-6 seconds before it would work correctly. None of this happened when it was new. Ever. But, I didn’t trust my ears. I figured that maybe I was playing on semi-weighted keyboards too much, or was spending too much time on actual digital pianos, or perhaps I was just imagining the delay/weird attack envelope. But that all changed tonight. I was at the first rehearsal for a brand new band tonight, and my setup was the usual for this situation (rehearsing at a church with certain sound limitations). 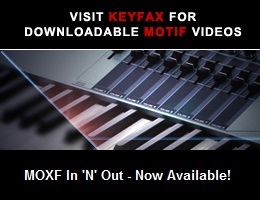 Motif XF8 with FC3a and FC7, controlled via 5-pin Midi from a Yamaha YS200 keyboard (Midi Out on the YS to Midi In on the Motif). The YS transmits on Channel 2, and the Motif on channel 1. Mono out (R) from Motif to FOH via DI. No sounds from the YS (so no audio inputs being used, no assignable outs either). No pedals on the YS. Using Master mode to switch between Songs and Patterns. No controllers or keys held during transitions. I switched from Master Mode into Song Mode to change out a voice in Mixing Mode. As soon as I pressed the Mixing mode button, everything froze. The keyboard was unresponsive, none of the buttons or the scroll wheel did anything, the screen was frozen and there was no sound. So since we were in-between songs, I power cycled the keyboard (off then back on via the switch on the back). It seemed OK for the next two songs. I pressed the next Master Program button to advance to the next song in our set. Everything froze again. The screen seemed to be slightly “fuzzy”, and once again nothing worked. I let it sit for a few minutes, but nothing changed. There was nothing that would “snap” it out of the freeze, so I shut it off. I ended up playing the rest of rehearsal on the YS200. Nothing has ever been spilled on the keyboard, it’s never been dropped, and has had nothing but “normal” usage. I assume that Mixing Mode is used by people often. My OS version is 1.50, and this Motif XF8 was manufactured in February of 2016. It’s only 2 years old!!! Do I need to take the Motif in to a service center? It looks like the warranty was only one year, and it is two years old now. I’m not too happy about this. It’s not like people spend 3000-4000 every day on new gear (well, not all of us), and expect it to only last a few years. Advice??? P.S. I read the other threads on the XF and other Motifs freezing up that I could find, before posting this. It can’t be an old OS problem because I am current. Etc. How do you slave the XF with the YS, with the XF in Master Mode? Try disconnecting all external MIDI - 5-pin, USB, FireWire if your XF has it. Put the XF through its paces. Let us know if the problems still occur. I have the YS transmitting on MIDI channel two. I set up the transmit channel on the YS. I don’t have anything set in Master mode. I have voices assigned in Mixing Mode to channel two. Then I have Master Mode reference the song/pattern, and I program that to one of the 1-16 buttons. When using performances, the YS does not control anything, and I only use the Motif. OK, I will do this once I get back from church today and get everything set back up. Alright, I’m back, so I will get it set up and run through everything as suggested. I should add, I do not have Firewire or any Flash boards installed. OK. I did as 5pinDin asked. I have been unable to get the freezing to occur. I’ve tried the same types of button combinations and edits that I used last night. Nothing freezes. This is with the FC3a and FC7 still connected, line out to a speaker, and the standard power connector plugged into a power strip. OK. You mentioned that the YS200’s MIDI-Out had been connected to the XF8’s MIDI-In. Were there any other MIDI connections (5-pin or USB) to the XF8? No, there was nothing connected to either the USB ports or the MIDI Out and Thru on the Motif. There were no other external sources of MIDI besides the YS. While it’s possible that your XF8 itself is having problems, my experience with the Motifs is that they tend to be quite reliable. Many things that at first seem to have internal causes turn out to be externally influenced. The sort of difficulty you experienced can be caused by a MIDI data issue (something originating in the YS200). It might also be related to an AC power (voltage) issue. I suggest that you continue to use the XF8 for as long as you can with the YS200 disconnected, and monitor the situation. If the problem doesn’t recur, reconnect the YS200 via MIDI, and see if it returns. Let us know what you determine. Alright, I will do what I can. However, I have more gigs coming up in the next few weeks where I will need to use two keyboards, and I don’t own anything else that is “professional” level or has the capabilities that I need. Generally I need to be able to switch registrations for 5-6 songs, with anywhere from 3-7 sounds per song. I also have to play LH bass for a few of the gigs. So I might end up using the YS200 as a secondary sound source plus my YPG-235 as the main keyboard. No MIDI, because the YPG only supports USB midi out. :-/ I don’t have any other keyboards that output 5-pin MIDI that I could swap out for use with the Motif either. Thanks, I will do what I can do. Alright, I will do what I can. However, I have more gigs coming up in the next few weeks where I will need to use two keyboards, and I don’t own anything else that is “professional” level or has the capabilities that I need. Then just use the XF8 for a few more hours without the YS200 connected. If nothing seems amiss, reconnect the YS200 and see if you can get the XF8 to freeze or otherwise significantly misbehave. If that happens, don’t power cycle (or anything similar) the XF8 - rather, just disconnect the MIDI-In cable, and see if the problem clears within a short time. If it does, that points to the XF8 reacting to something coming via MIDI from the YS200. I presume you meant that it’s the YPG-235 that has only USB MIDI. I know the YS200 very well (I have one, and wrote editor/librarian software for it about 25 years ago), and it has 5-pin MIDI only. I don’t have any other keyboards that output 5-pin MIDI that I could swap out for use with the Motif either. Keep us posted. Hopefully with more information, and some luck, we’ll figure out what’s happening and come up with a solution. Sorry, it’s a typo. Yes, the YPG only outputs USB midi. Too many things going on in my head I guess. I’ll fix it. Tonight I ran the XF8 for two hours on end, but was unable to get anything to misbehave. So I plugged in the YS200, and ran the Motif for another 30 minutes. I edited Mixings and assigned midi channels and did everything that I remember doing Saturday night, but nothing froze. The only thing I could get to happen was that there would be notes held if I switched from a Voice to a Performance or from a Performance to a Song/Pattern manually (not using Master mode) while playing, and the keyboard would be a bit slow. I assume that’s normal? I don’t ever hold notes over switches, so I don’t know. I guess also when I would go from Voice mode or Performance mode to Master Mode where I have songs and patterns assigned, the keyboard would seem to have a hard time “remembering” what was programmed to the buttons, i.e. I would play the keys and for 5 seconds or so it would cycle through 1-2 other Voices, songs, or Performances, even if that wasn’t the type of setup that was being referenced. Like I would press a button for a Mixing setup of five pop-type sounds, and when I played the keys, I would hear an accordion voice, and then it would cut off and switch to some performance, and then finally cut off and switch to the Mixing that I had programmed to it. So I can’t get anything to malfunction no matter how many rapid sequences of button-presses I do (much faster than usual). It’s really weird. I’m going to try running it some more tomorrow with the YS200 connected and everything set up the way it was at rehearsal (headphones plugged in but not used, for example). We’ll see. I wish something would just become obvious, rather than everything seem fine until the next time it freezes. One thing to note, now that I think about it, was that at rehearsal we were getting in the local sports radio station through the monitors when the keyboard or the piano mics were on. The singers’ mics didn’t do that. The drums weren’t miced, and there were no other instruments at that rehearsal. I don’t know if that affects anything though, just thought I’d mention it just in case. Switching of modes isn’t instantaneous. What you’re experiencing appears to be normal. It’s possible that the problem might be related to the “environment” - that is, conditions at your rehearsal space. One thing I previously mentioned was AC power. Is the line voltage known to be adequate and stable at the rehearsal location? A sufficiently strong RF signal can play havoc with gear. Being picked up on mics doesn’t necessarily indicate that other problems would occur, but it’s possible. Just how nearby is the “local” station’s transmitting antenna? If either inadequate AC power or RFI are the cause of problems, it may be that your home location won’t ever reveal a problem. The XF is fairly well shielded, and tolerant of voltage fluctuations to a degree. That’s less true of the YS200. Unfortunately, the problem is difficult to diagnose unless it can be repeated. Good luck. Keep us posted. I’m not sure as to the stability of the AC there. I’ve never heard of there being any problems, and the church actually uses another Motif XF8 there regularly (not my church). I don’t recall having any issues before. This is only the second time using my own Motif there; the other times I would use the church keyboard but add my equipment on to it. That’s not practical this time around.